Jack Frost has promised not to trouble the Rainbow Fairies again, but he didn't say anything about the Weather Fairies! Now he has stolen the feathers from Doodle, the weather-vane cockerel in charge of the weather. It's up to Rachel and Kirsty to get each of the feathers back from Jack Frost's goblins, with a little bit of help from the weather fairies: Crystal the Snow Fairy, Abigail the breeze Fairy, Pearl the Cloud Fairy, Goldy the Sunshine Fairy, Evie the Mist Fairy, Storm the Lightning Fairy and Hayley the Rain Fairy. Pearl the cloud fairy is down in the dumps without her fluffy cloud feather. Rachel and Kirsty need a ticklish plan to cheer her up. 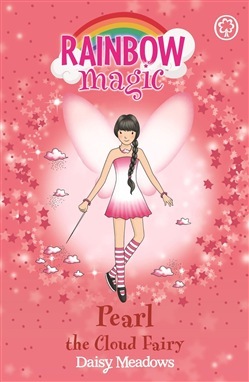 Acquista Pearl The Cloud Fairy in Epub: dopo aver letto l’ebook Pearl The Cloud Fairy di Daisy Meadows ti invitiamo a lasciarci una Recensione qui sotto: sarà utile agli utenti che non abbiano ancora letto questo libro e che vogliano avere delle opinioni altrui. L’opinione su di un libro è molto soggettiva e per questo leggere eventuali recensioni negative non ci dovrà frenare dall’acquisto, anzi dovrà spingerci ad acquistare il libro in fretta per poter dire la nostra ed eventualmente smentire quanto commentato da altri, contribuendo ad arricchire più possibile i commenti e dare sempre più spunti di confronto al pubblico online.